How is it that we live in a city surrounded by water and yet casual harbour side dining venues are few and far between? Sure, we have Icebergs and ARIA but what about a restaurant that doesn’t sap up half your weekly wage in a few meagre mouthfuls? Not only is Dunbar House located in one of Australia’s oldest standing buildings, it also happens to be 30 metres from the shores of Watsons Bay. Ask for a table on the sandstone verandah to experience harbour-side dining at its best or, if it’s too windy, head inside where you will discover a chic and elegant sanctuary where groups of Eastern Suburbs ladies enjoy long lunches and high teas. 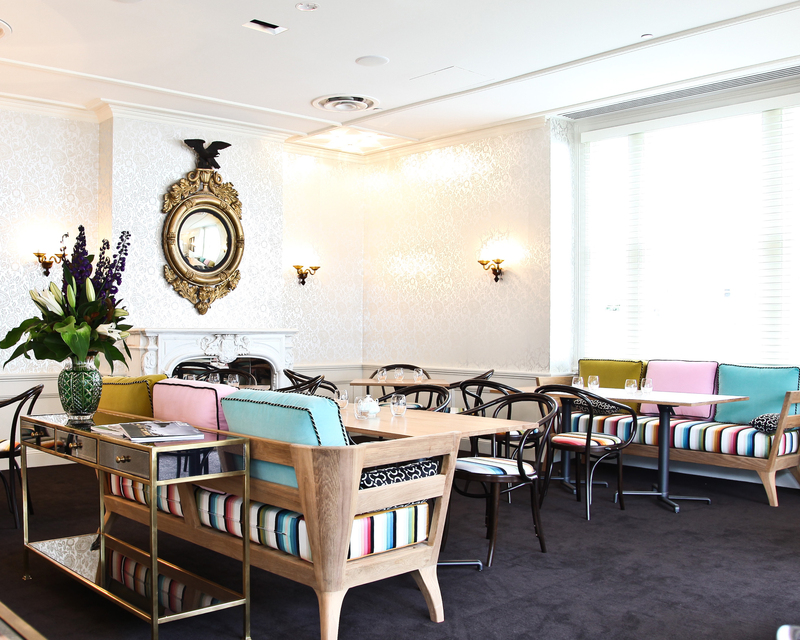 Glamorous gold gilt mirrors hang on walls that have been lined with William Morris paper while custom-made furniture, upholstered using vibrant Missoni fabrics, make up Dunbar’s interior. The elegance isn’t reserved for the décor – high tea is served on pastel-coloured Wedgewood china plates, sauces and stands, all from the Harlequin collection. Looking around, I half expect to see women dressed in full length dresses with gloves and exotic plumes. 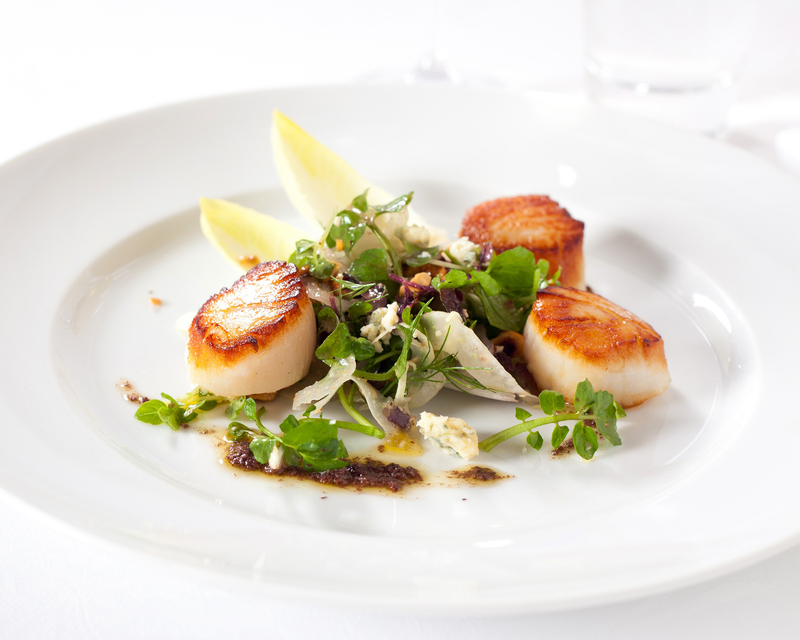 From Dunbar’s “Summer Nights” menu – pan fried scallops, blue cheese, radish and witlof. Despite the suave surrounds, the menu is expansive, with enough options to appease even the fussiest of Eastern Suburbs diners. For breakfast, the waffles with honeycomb butter and poached seasonal fruits are worth an indulgent splurge or for those watching their waistlines, there is a selection of omelettes and dishes such as bircher muesli and house baked granola. The lunch menu puts other café menus to shame with dishes such as salmon ceviche, wagyu meatballs with orecchiette and spiced lamb and haloumi salad. It reminds me of Café Sopra at Fratelli Fresh – and the quality of the ingredients speaks in the same tongue. Watsons Bay is geographically pretty close to the city (11km to be exact) but it isn’t the easiest place to get to. If you’re visiting during the week, the drive is easy and quick but for weekend bookings, it is best to catch a ferry to avoid the city-to-east traffic.